I don’t like coffee. For one, caffeine upsets my stomach, but more importantly, I just don’t like the taste. Or the smell. 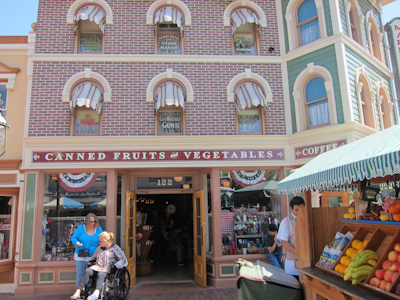 I did not let that stop me from going into the Market House on Main Street, which you will find right next to the fruit cart. 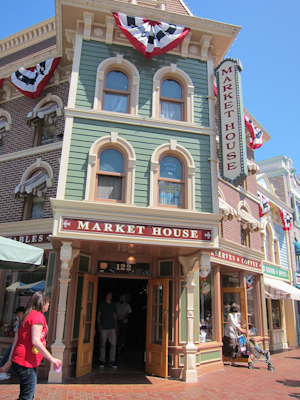 What does coffee and Market House have to do with each other? Well, the Market House sells coffee. 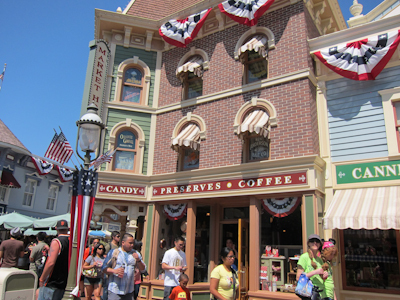 It also claims to serve candy (yes) and preserves (no). 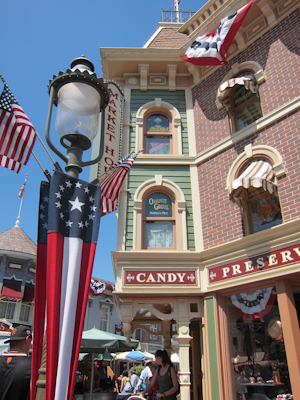 Like the rest of the stores on Main Street, there are some fun details if you look up. Except that I can't read any of the windows. Sorry. 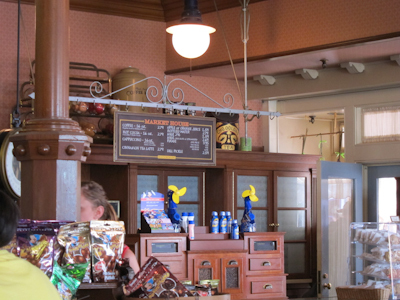 The Market House is actually on a little corner leading to the lockers, dentist office, and surprise ice cream window. I didn't see any canned fruits and vegetables inside either. There definitely is coffee though. 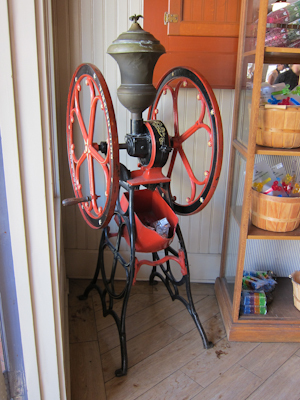 Over in a corner there’s an apparatus I can only assume was an old coffee mill. On a side note, every time I hear about an old coffee grinder, I think of the Little House On the Prairie book The Long Winter when there’s like 25 blizzards in a row and they’re all starving to death and twisting straw into log-things for the fire, and then Pa finds a secret stash of wheat and they grind it up in their little coffee grinder. And then they sat around snowed in and starving for 7 months (true fact! actually happened!) reading a couple of magazines. Such fortitude! Also, that has nothing to do with Disneyland. Clearly. "Yes, I'd like a cup of coffee and one of those squirt bottles with a fan to go, please"
The coffee bar doesn’t get a lot of love in the summer, so they add a few things to make it more appealing, like sunscreen and the aforementioned squirt bottle. Can’t decide what to drink your coffee at home out of? Fear not! 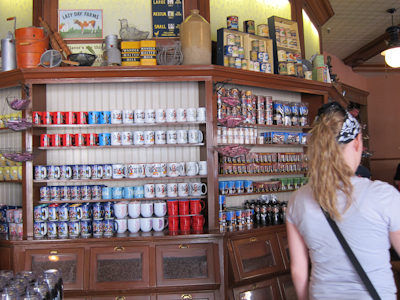 The Market House has a wide selection of coffee-appropriate drinking vessels. 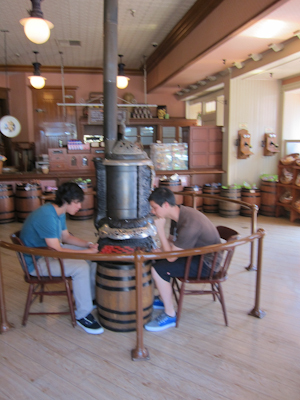 There’s a quaint potbelly-ish stove in the middle, and to top off the oldey timey effects, you can sit and play a round of checkers. All that’s missing is the cracker barrel. Which they could actually fill with Mickey-shaped Saltines and probably make some money that way. Other oldey timey effects include cute little things atop the merchandise fixtures. Just like Ma and Pa Ingalls had! There are also fake bins that make it looks like they sell different, um, different things you find in bins. 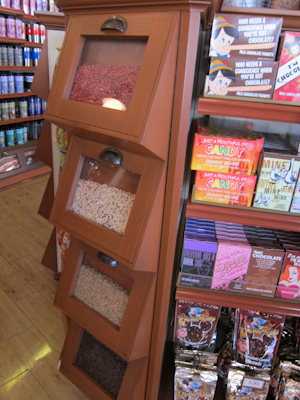 Those fixtures also hold most of the candy for sale, as you can see in the above pic. 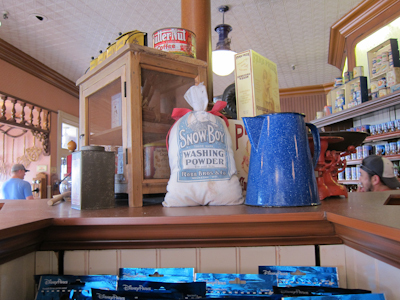 There’s some generic Disney candy around with a few specialty items, including this alarming display. Yes, over on the right that’s Tinkerbell with satanic red eyes just dying to shoot you some laser beams, or maybe those red light pointers you use to drive cats crazy, but that pales in comparison to what’s on the left. What does liar’s chocolate taste like? Inquiring minds want to know. You mean you want me to buy it to find out? I kinda feel like I’d need to pack it in a plain brown paper bag. I have to say that the white chocolate raspberry cookie I got at The Market House was AMAZING. Also, their hot chocolate is rich and tasty and perfect when waiting for the fireworks to start during the chillier months. Very good to know–I’m not a fan of the hot chocolate from the carts, so this is definitely worth a try. The Market House did have really yummmy cookies. The coffee, however, not so much. It was awful, even after 5 creamers and 8 sugars. Better to stand in the loooooong line across the street. I’ve never done the cookies before, but with two thumbs-up comments, I’ll have to try them. I’ll have to take your word for it on the coffee ;). If you don’t like coffee, there is nothing I can do for you, but The Market house has about the best drink deal at the park. If you buy a cup of coffee there, for the rest of the day, when you present your receipt at the Market house, they will give you a fresh cup of coffee. I like to create my own version of iced coffee. I bring my own large (32 oz) refillable mug and have one of the drink vendors fill it with ice, then I add three or four packets of sweetener and a few ounces of cream, then I slowly pour my fresh, hot coffee slowly over the ice, then mix my drink and I have a large refreshing cup of iced coffee. I would often create my own iced coffee three or four times a day. Great tip for the coffee lovers! 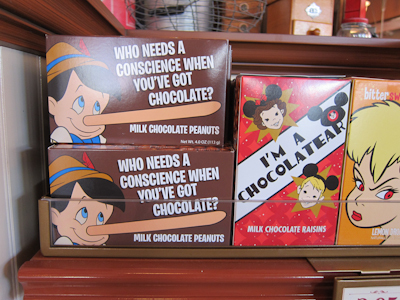 I just lost it over the box of pinnochio chocolate! WOW. This post made me realize that I indeed have a question for you: is there a favorite grocery food item you like from Disney? My in-laws gave us a Mickey macaroni and cheese kit one time, and my daughter Rosebud keeps asking for that. I’ve also been given Disney themed tea from one of the parks, and it’s been very good. I don’t really buy any grocery-type items other than candy or sweet treats like cookies, caramel apples, and rice crispie treats. There’s some really fun stuff on the shelves though :). Oh Em Gee, the pinnochio box is TOO funny, I was just laughing like crazy! Is it just me and my 13 year old brain that thinks the box look dirty? I feel like if I were with my kids I would need to cover their eyes lol!